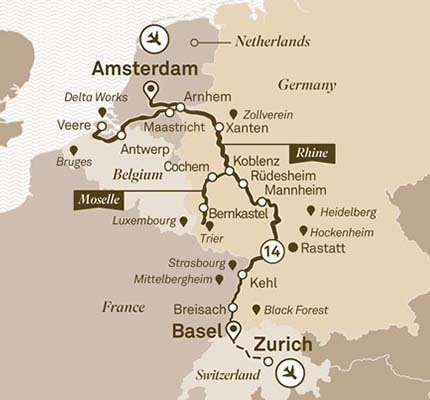 Discover the hidden gems of the Rhine and the Moselle Rivers from the small canals of Amsterdam to the majestic mountains of Zurich. Charming villages and beautiful cities await you as you travel through this historic and elegant waterway. Admire the beautiful Moselle Valley in comfort and life-changing luxury on this 15 day European River Cruise. Vogtsbauernhof Open Air Museum in the Black Forest. Visit Strasbourg and sample wines in Mittelbergheim. Private tour of the Baroque Palace of Rastatt and exclusive classical concert. Sweet Tastes of Heidelberg tour.Mini train ride and guided visit of Siegfried’s Mechanical Musical Instrument Museum. Guided city tour of Cochem and Reichsburg Castle. Cycling in the Moselle Valley. Explore Netherlands Open Air Museum or Arnhem Airborne Museum. Enjoy a guided walk through Antwerp. ^Pricing is based on 24 April 2019 departure, other dates may have a different pricing.